Without mentioning names, went to a known Pin /games retailer based SW London area to view a couple of Pins last week and although the staff were welcoming. One Pin was locked away in storage(Aerosmith) at another location for some unknown reason even though it was advertised on website at above normal retail and the other was offered at around normal retail price and had major cab split damage. I’m now over in Bristol this week working and popped in to view an Aerosmith for sale offered at near expected retail price. Again, staff were nice and accommodating bunch, great venue setup, really impressive But unfortunately, another split cab. See attached. The Aerosmith also had Cabinet decal damage, missing rubbers on head unit for playfield up rest etc......not sure how they could sell for this price asked with all wear and tear...., especially when I pushed them on the history and it lived in a Bingo Hall sold on by an operator. One of the reasons I lose a bit of confidence in the 2nd hand Pin market. Id rather people were honest and up front then expectations are met from the outset. Maybe I’m being too fussy.....think my next Pin will be NIB again........photo attached. I would avoid the retailers like the plague! Best place to find a well looked after machine for a price that is reasonable is on here. If buying new then Phil Palmer is your guy. Companies like HL Direct should be avoided on my opinion. They asked me if I was still interested even with the split cab, that’s when I started looking closer and noticed the decal pealing off on the left side of the head unit in two corners quite bad. The metal part behind the elevator has taken a severe beating as has the magnet (which is normal) but it all had the hallmarks of a heavily used Pin. The staff said it was sat doing nothing in a Bingo hall.....I beg to differ, I’m sure that’s what the operator told them. They must sell stuff because they carry on running. There must presumably be a reasonably sized market out there of people who just Google "pinball machines", find themselves on their website and the rest is history. I've never been able to figure out whether as a general rule us collectors are more picky with the condition of machines or whether the retailers actually don't give a hoot about selling knackered games. I also find it a tad strange that some retailers are prepared to purchase expensive PINs NIB - set them up for free play, let all the staff play on them , all potential customers play on them for months then try and punt them on for the same price or more as NIB, I guess they must still move them on ok....I understand doing this with 2nd hand and refurbished models and then pricing accordingly for the workmanship that’s been put into them etc...... but if customer buys NIB at NIB prices then surely they want the pleasure of opening the box and being the first one to pull the plunger ? Would you pay for an LE at LE prices upon release of a new pin that’s has 500 plays by Joe Public? Well that's a new challenge to the guys who can make your car look like it only did 3,000 miles a year!!!!! You should really name and shame these people and save others ballache imho. Home Leisure Direct or Liberty Games? My naivety is likely to show in this question, but surely if you're buying a new in box from either Phil or the other two major pinball machine retailers, mentioned above, then that's what should arrive on your door step, an untouched new in box machine. The only difference between retailers being, price, customer service and post sale support. Wonder why they haven't got replacements from Stern for the split cabs? I thought that was an issue that pretty much happened when NIB? I guess some retailers list stuff as "new" when its not previously been sold, a bit like how some people on eBay list stuff as "new" and then say "only opened to check it was inside which I know doesn't make any sense but just trust me ok" or "only used once, didn't like it". Phil's NIB would be NIB - you'd be the first person to open it. Is it? or Does Phil do PDI (Pre-Delivery Check/inspections)?? I guess if you were concerned, you could ask the question and if you still had doubts, walk away or ask them to put it in writing. Any legitimate company would gladly oblige. Just buy games from trusted sellers here or NIB from PH. Couple of really nice Aerosmith's HUO in last 12 months - £4500 or less. Can see the split cab a mile off! Guaranteed lowest price Aerosmith Pinball Machine Pro. Buy Now Pay Later available, plus 2 Year Warranty and Free Delivery and Installation. Is there a quality issue with newer cabs? I would pretty much always prep a game for an operator to ensure its latest code and nothing needs adjusting. 95% of the games I sell I dont ever see to open them. Well colour me surprised at who is it! Yup - ive our reinforcements on all my modern sterns. Some sort of glue problem. This pinball machine was only released in recent years, and as a result looks practically fresh from the box with minimal playfield and cabinet wear. All our pinball machines go through a thorough inspection and reconditioning process, ensuring that they play perfectly with no errors. We will fit new balls and new rubbers where necessary. New decals and parts will be fitted where necessary. We will make cosmetic repairs if needed. 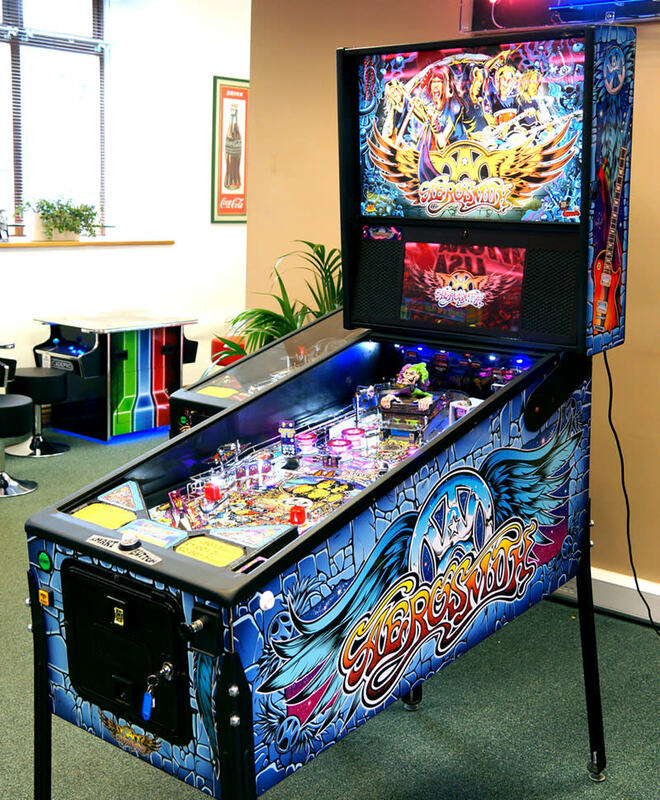 We describe our pinball machines as being in excellent reconditioned condition. We will make cosmetic repairs if needed. I mean does a split cab not count as a cosmetic repair that's needed? We will fit new balls and new rubbers where necessary. So you buy a game at a hugely inflated price and they won't even spend £30 on a rubber kit and new balls for you if it's not deemed necessary? Jesus. Cabinet swap is the way forward. It isn’t a two year warranty, that’s just standard web speak for new machines so descriptive is wrong. The other side of the cab was also starting to split albeit not as bad which may be strange for a 2017 production machine. You will see from the web there is no photo of the left head unit decal.....because it’s pealing unfortunately.